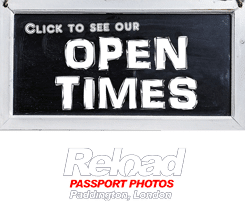 If your are applying for a Panama passport or visa and are in need of a Panama passport photo or visa photo, then Reload Internet is the best studio to visit! We are situated in Paddington, London, and stay open throughout the week from early morning until late evening so that you can come and visit us at a time that suits you! We take hundreds of passport and visa photographs every week, and our staff have been fully trained to provide with you a set of high quality photos that meet all of the necessary requirements stated by the Embassy of Panama. You don’t need an appointment to have your Panama passport photo or visa photo taken with us, just pop by our store and a member of our team will be happy to assist you. We aim to have our customers photos ready within 10 minutes of their arrival, as we know that submitting a Panama passport/visa application is extremely time consuming. We will provide you with a set of 4 photographs at a reasonable price, and they come with a guarantee to be accepted the first time that you submit them to the Embassy of Panama with your application. We will cross-check your photograph to ensure that it will pass before we even print it! So there’s no need to worry about wether your photograph will cause an issue when you come to Reload Internet. You must make sure that your Panama passport photo or visa photo meets all of the criteria below, as if it doesn’t then it’s extremely likely that your application will be rejected at the Embassy when you go to submit it. This will cost you money, time and stress, and is easily avoidable if you come to Reload Internet, as we can guarantee to eliminate any possible delay that might occur due to a photograph error. Three (3) identical photographs must be submitted, They should be 2″ x 2″ in Width and Height. 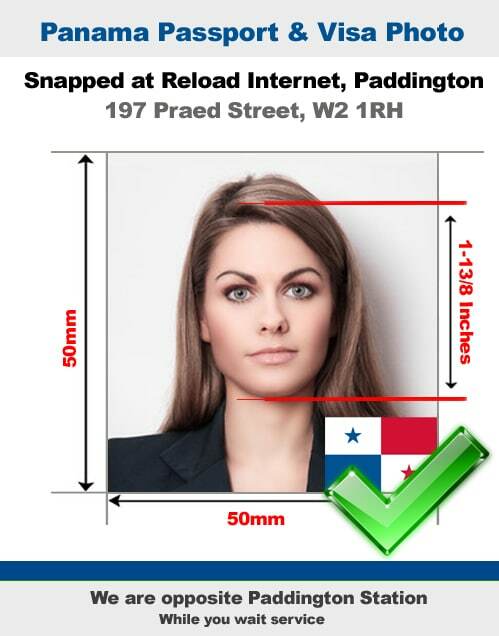 Your Panama passport photo or visa photo is meant to feature a neutral expression of your face, coupled with the top of your shoulder, thereby taking about 60% – 70% of the face or 1″ x 1 3/8″from the chin to the crown of the head. Your face must not be bent or obviously smiley, from the bottom of your chin to the top of your head, including the two sides of your face. If you have a long hair, make sure your hair or hair style is not covering a huge part of your face. Your face must be positioned in the middle of the picture and no more than six months old, to ensure an up to date likeness. The background should be white. The background should not carry any form of design. The photo is to feature the face of the person to be photographed alone (it must be without any second face or object). The photo background must not carry any shadow. Ensure your facial expression is neutral in the photo; smiling, laughing, frowning or opening of mouth will not be acceptable. The two of your eye must not be closed, avoid contrived expressions like closing your eyes halfway or raising your eyebrows. Ensure your head is not positioned in form of an oblique or bent in the photo, use portrait pattern. Your head must be square to the camera; the face of the photographed person must not be angled or tilted. Your face and eyes must be focused directly to the camera so that the right measure of your ear and cheek can be featured. Ensure you stare straight at the camera while your Panama passport photo or visa photo is taken. Your eyes must be clearly seen and shouldn’t be obstructed by anything including hairs or eyeglass frame. The photo must be captured at a position where the camera lens and the person’s eye level are opposite each other, not more or less. The resolution quality of the printed photo should be high, at least 600 dpi (preferably with a digital camera). The colour of the photo must be left natural, including the skin tones. The photo must be smooth, without any dirt, squeezing or bent impression. Photos edited to modify image or clean spots and scratches will not be accepted. Photos must be in color. Your photo will be approved easily if you are not wearing glasses. But if a spec must be on your face, then ensure it’s a plain glass and its frame must not block any part of your eyes. Your eyes must be easily visible. The camera flash must affect every side of the photo equally, if there are shadows, or red eyes or light reflections on the photo, it will be rejected. However, photos snapped with head wears will not be approved. It will only be permitted for religious conditions. In this regards, the head wear must not cover your face, your face must be featured fully in the photo from the bottom of your chin to the top of your head. Shadows must not be seen anywhere around your face. Every aspect of your face must be plainly visible, with the perfect brightness level. Out of the duplicate copies, one among the photos will be approved as being preferred by the applicant. We receive our specifications directly from the Embassy of Panama’s guidelines on passport and visa photographs, which you can see here. You must ensure that your Panama passport photo or visa photo meets all of the specifications above, as if it doesn’t your application will be rejected.